I seem to cook with a lot of fennel for someone who professes not to like it. Methinks plan Fennel: Inundation is working, because I sucked down this saffron rice pilaf with fennel and pine nuts like saffron rice pilaf is going out of style. * I’ve not yet mastered raw fennel, but cooked fennel and I have become much closer over the past few weeks. Who’d’a thunk it? Before you know it, I’ll willingly be eating things like olives and chicken livers. ** HEAVEN FORFEND. I’ll have to eat my words, along with my fennel. *Is it? I feel like I’m always the last to know these things. You would tell me, right? **A Lie. I will NEVER eat chicken livers. I wanted a rice dish to pair with some pan-seared halibut, so I threw together this pilaf with some bouillabaisse-y flavors. I sauteed some onion, fennel and garlic, then threw in a hearty pinch of crushed red pepper flakes and left them to bloom for a few minutes. Over dinner, Brian asked me what made it a pilaf, and I had no real answer other than a lame, “It has nuts in it?” I could do some research and give you a real answer, but that’s antithetical to my style, which is to make you do your own damn homework. The good Lord made Wikipedia for a reason. The rice was something of a risk for me. 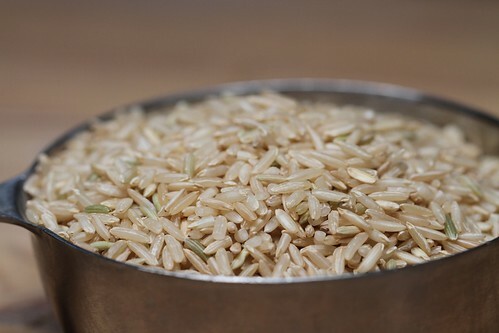 Historically, the only rice I can cook properly is long grain white rice cooked in coconut milk. Anything else scorches fast to the bottom of the pot, while the non-incinerated grains remain undercooked. And then I inevitably leave the pot in the sink for two weeks under the pretense of “soaking,” until Brian eventually gets sick of it and washes it, which makes him cranky. In the interest of averting marital discord, I don’t cook rice very often. So it was throwing all caution to the wind to try this brown basmati rice, rice which is (1) not white and (2) not cooked in coconut milk. Hey, you only live once. I stirred the rice into the aromatics, then poured in some chicken stock and added a bit of salt and some saffron. Then I finished reading the rice package, and noticed that this rice had to cook for FIFTY FRICKING MINUTES. On a WEEKDAY, no less! * Who has this kind of time? Brown basmati rice is uppity, that’s what I say. Luckily, Brian was coming home late anyway because he had to stop by the Honda dealership to pick up the extra keys to our new Lego-Mobile Element, so I had the time. I flopped down on the sofa, waiting and happily inhaling the intense garlicky scent emanating from the pot. *I mean, it cooks for 50 minutes regardless of the day of the week. 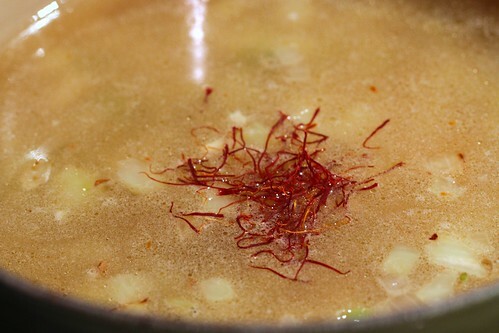 After fifty minutes, the rice had absorbed almost all the stock and was a gorgeous saturated yellow. 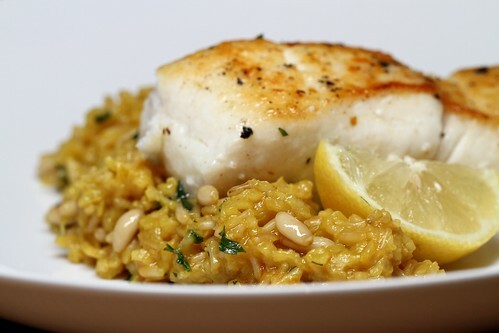 I toasted up some pine nuts and chopped a bit of Italian flat-leaf parsley – curly parsley shall not sully my pilaf – and stirred it in while searing off two pieces of simply seasoned halibut. After putting my dish together, I squeezed a lemon half over both the fish and rice to give it a jolt of brightness. Dude. Duuuude. DUDE. This rice is RIDONKULOUS. So richly flavored, so perfectly seasoned, so beautiful, so redolent with herbs and spices. I ate the excess out of the pot while I plated dinner, then I ate dinner, then I returned to the pot and kept eating. The brown rice is toothsome, the nuts add more texture, there’s the barest hint of heat at the back of the throat, and the lemon lifts all the flavors. It’s a shame brown basmatic rice takes FIFTY FREAKING MINUTES to cook, meaning I will probably rarely make this. On another note, for those who may be wondering, the shrink and I continue to pursue Plan R. I would estimate that roughly 15-20% of my mojo has returned, which is either encouraging or frustrating depending on my mood. If, in another three weeks, my mojo remains on a flex-time schedule, I’ll likely shell out the big bucks to a mojo restoration technician, also known as “The Bipolar Disorder Specialist Who Charges $400 an Hour.” So there you go, and thanks again for the good wishes! In a heavy sauce pan, heat the oil over medium heat. 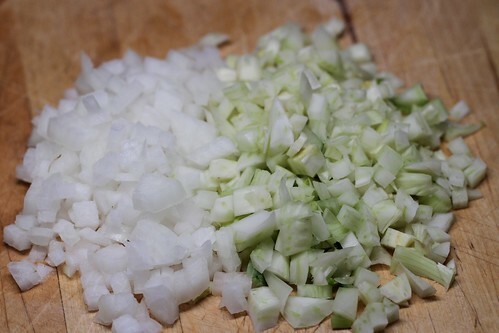 Add the onion and fennel and cook for 6 minutes. 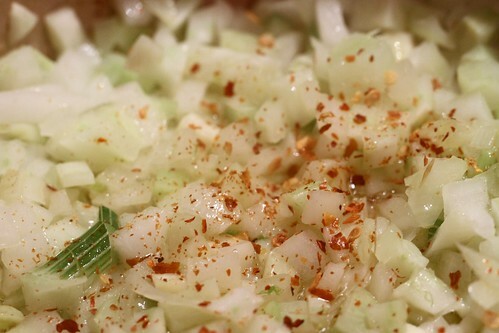 Add the garlic and pepper flakes and cook one minute more. Stir in the rice, stock, saffron and a good pinch of salt. Bring everything to a boil, then reduce to a simmer, cover and let cook for 50 minutes, until the rice has absorbed all the liquid. 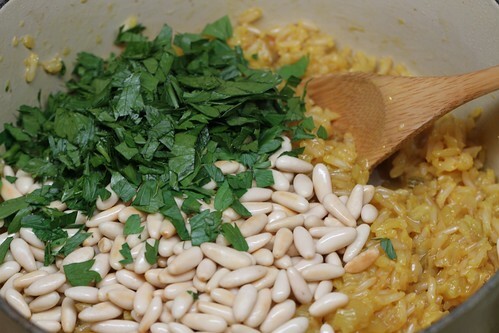 Once the rice is cooked, stir in the pine nuts and parsley, and check the salt level; add a bit more if necessary. Serve hot, squeezing fresh lemon juice over the plated pilaf. You should try a ragu bolognese with chicken livers, you won’t be able to tell they’re there. My cats won’t even eat chicken livers. I don’t even know how I know that, I don’t recall ever buying them. And on the rice-sticking thing: I read recently that if you cover the pot when the rice is done, take it off the heat and let it sit for 5 minutes or so, the rice steams a bit more, gets all fluffy, and magically unsticks itself from the bottom of the pot. And? IT TOTALLY WORKS. I’m so glad to know there are other foodies out there who don’t like olives. And while I agree about chicken livers, sweetbreads are delicious. Do you think this will work with camargue rice? @hebby, i would imagine so, although the ratio of rice to liquid might be different, so you may need more stock, and the cooking time is probably different as well. but the flavors should work. good luck! I want to like olives, truly I do, but they’re disgusting. @mary, sorry it wasn’t a hit for you!